Nosiheptide is a kind of special sulfur-polypeptide antibiotic for animal, environmentally feed additives. 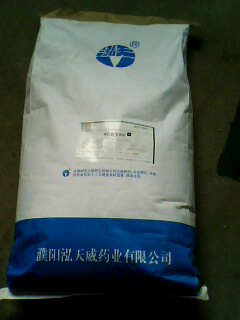 Significantly promote the growth of livestock and poultry, improve the feed efficiency. No resistance, no cross resistance with other antibiotics. Not to be absorbed in animal intestinal tract,no drug residue. It’s safe to human and livestock, environmental protection to the environment. In the 1960s，Nosiheptide is separated from the Argentina soil by French scientists, is a good type of non-absorptive feed additives.It doesn’t affect the palatability of feed, it promotes the growth and weight of pig、chicken、duck、shrimp、freshwater fish and other aquatic animals, it also improves the feed efficiency. France and Japan have officially put it to the market as feed additives, it is the antibiotic approved by Agriculture Ministry of China in recent years,it’s used more and more times in animal husbandry. Yellow-green material, powder or fine needle crystal,its melting point is 310-320℃(with decomposition ).It’s soluble in chloroform, dimethylformamide, dimethyl sulfoxide,lightly soluble in carbinol, ethanol, acetidin and benzene,not soluble in water and petroleum ether. Nosiheptide has strong activity on against G- bacterium and G+ bacterium,especially staphylococcus. The mechanism of action is restraining the protein synthesis. Control the bacteria in the low concentration,kill the bacteria in the high concentration. Nosiheptide resist the breeding of harmful bacterium in the intestinal tract, so it promotes the growth of livestock and poultry, improves the feed efficiency. No resistance, no cross resistance with other antibiotics. Small toxicity, safe to human and livestock. No drug residue, is a good type of non-absorptive feed additives. The test to Nosiheptide using staphylococcus and streptococcus shows,these two strains has no resistance. The Sensitivity test to Nosiheptide using golden staphylococcus shows, Nosiheptide has no cross resistance with other antibiotics. It shows that Nosiheptide won't cause cross resistance. The half-life of discharged Nosiheptide in dejecta of pig and chicken is one month and 20 days, applied these dejecta as ingredients to plants,found that Nosiheptide has no drug residues in plant, and no inhibitory action on higher plan herbicide activity and insecticide activity.It has inhibitory action on part of some algae and soil bacteria. No hindered activity on the active sludge microbial, and no side effects. Therefore the impact on the environment of Nosiheptide is minuteness. feed the pig 0-500mg/kg Nosiheptide for 90days, slaughter them in medicine time or after the treatment of 0-7 days,the result shows, the residual quantity of liver、 muscle、spleen、heart is lower than 0.025mg/kg. ( below the critical value ). Do test using C14 Nosiheptide,the test shows,most of Nosiheptide are discharged to dejecta,this proves that Nosiheptide plays a role in the intestinal but not broken down and absorbed, no drug residue in animal visceras. Slaughter the chicken after 16、48 and 72hs with the treatment of 2.5mg/kg、5mg/kg, detect the muscle、heart and other visceras with different methods,the result shows, the residual quantity of Nosiheptide are all lower than 0.01mg/kg. China Agricultural University(2008)does a test,the result shows, feed the pig 20mg/kg Nosiheptide for 28days,no residue in muscle and other visceras. Feed the Penaeus Vannamei 2.5mg/kg Nosiheptide for 90days, select samples after 12、24、48、72 and 148hs with the treatment,the result shows, the residual quantity of Nosiheptide in muscle and head are lower than 0.01mg/kg. China Agricultural University national veterinary drug residue reference laboratories does the safety test to pig. Feed the pig 20-100mg/kg Nosiheptide for 28days,there is no adverse effect to the food, action, breath and excretion.This shows,the range of 20-100mg/kg is safe to pig. Small toxicity. Acute toxicity test shows,the LD of oral medicine to rat is more than 13060mg/kg, the LD of hypodermic injection is more than 4160mg/kg. No toxicity in Clinical examination, blood test and biochemistry examination. Safe to livestock.Feed 0-250mg/kg Nosiheptide to chicken and 0-500mg/kg to pig,the result shows，there is no effect to reproductive performance and production performance. Test 1: Nosiheptide can promote the growth of livestock and poultry, improve the feed efficiency and survival rate. Overall,add 2.5-5.0mg/kg Nosiheptide to chicken feed is best. Test 2：Add 1.25、2.5、5.0mg/kg Nosiheptide to chicken feed can promote the growth and improve the feed efficiency, 2.5mg/kg is best. Test 1:Compare 5 groups: 0.625mg/kg Nosiheptide group、 1.25mg/kg Nosiheptide group、2.5mg/kg Nosiheptide group with 100mg/kg Aureomycin group and blank group,the result shows: Nosiheptide can promote the growth of duck, improve the feed efficiency. Add 2.5-5.0mg/kg Nosiheptide is best. Test 2:The result of 1000 ducks shows, add 0.5mg/kg and 1.0mg/kg Nosiheptide to duck feed can promote the growth and improve the feed efficiency. Test 1:Significantly promote the growth of piglet and grower, improve the feed efficiency and survival rate, prevent diarrhea. Add 2.5-20mg/kg Nosiheptide to piglet for 12 weeks can gain weight 5-20%, improve the feed efficiency 5-15%,and inhibit piglet enteritis. Test 2: Add Nosiheptide to pig feed, the feed efficiency is highest in 5.5 mg/kg and heaviest in 6.8mg/kg, especially effective in winter. Test 3:Add Nosiheptide、avilamycin and virginiamycin to pig diet for 36 days.The result shows,the daily gain is higher than avilamycin and virginiamycin. Effect to production performance and diarrhea rate of Nosiheptide and colistin sulfate.The result shows,use Nosiheptide 5mg/kg together with colistin sulfate 40mg/kg can improve the daily gain ,prevent diarrhea. China Agricultural University（2008） does the safety test to pig. Feed the healthy pig 20mg/kg、60mg/kg and 100mg/kg Nosiheptide for 28days. The test of biochemical blood standard shows,there is no adverse effect to the food, action, breath and excretion, no any adverse reactions. Test 1:Add 2mg/kg and 3mg/kg Nosiheptide to Penaeus Vanmamei feed,the result shows,compare with blank group and flavomycin group, add 2 mg/kg Nosiheptide is best, reduce the feed coefficient, improve the protein efficiency. Dai Xianjun of Zhejiang university studied and found that 1.25-5mg/kg Nosiheptide can significantly promote the growth of Penaeus Vanmamei, reduce the feed coefficient, add 2.5 mg/kg Nosiheptide is best. In addition, Nosiheptide can improve the survival rate and increase anti-stress ability. Test 3: Add 0.25-3mg/kg Nosiheptide to Tilapia feed,the result shows,the growth rate is higher 10.5-47.8% than blank group（P<0.05）, the feed coefficient is lower 4.6-16.7% than blank group（P<0.05）. With growth and feed coefficient for the index, add 1.0mg/kg Nosiheptide to Tilapia feed is best. Zhejiang university tests the Growth Performance of weever.The result shows, add 1.25mg/kg Nosiheptide can significantly promote the daily growth of weever, reduce the feed coefficient, promote the development of intestinal villi. Feed the shrimp 2.5mg/kg Nosiheptide for 90days, select muscle and head as samples after 12、24、48、72 and 148hs with the treatment. Mensurate Nosiheptide residue by efficient liquid chromatography.The result shows, the residual quantity of Nosiheptide in muscle and head are all lower than 0.01mg/kg. According to Japanese Positive List System rules, the highest residue limits within 0.03 mg/kg in muscle、 fat、liver、kidney and other edible organization. So there is no residue in shrimp organization. 25kg per sack, stored in cool and dry place for 2 years.